Each of the airplanes in the photo below has a special significance to me. The airplane on the left represents God's protection and mercy. The one on the right reminds me of His faithfulness and provision for the needs of His children. Through both airplanes, and the stories that surround them, I am reminded of God's kindness, especially as it's been expressed by my brothers and sisters in Christ. N381MG and N64328, on the morning that we returned N64328 to its owner in Shelby, NC. If you have been following us for a while, you know that I was involved in a weather-related accident with MAG's training aircraft (on the left in the photo) early this year. The airplane was damaged significantly, and had to be disassembled for repairs. This was heartbreaking, but the outcome could have been much worse. I walked away with no injuries: not even a bruise or ache. I believe this was by the mercy of God. But equally amazing was the grace that was extended to me by everyone at MAG. 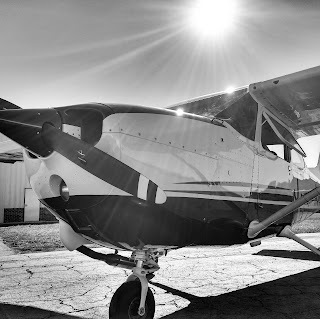 Not only did they not ground me (as I feared might happen); they supported my family and me through the tough process that ensued, and did everything they could to get me flying again—and flying as safely as possible. That's where the second airplane comes in. Although everyone at MAG wanted me flying as soon as possible, we had no airplane. 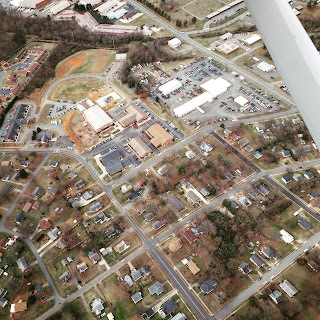 Then, through a chain of circumstances involving another organization (Compass Aviation in Shelby, NC), God provided the orange plane in the photo above. 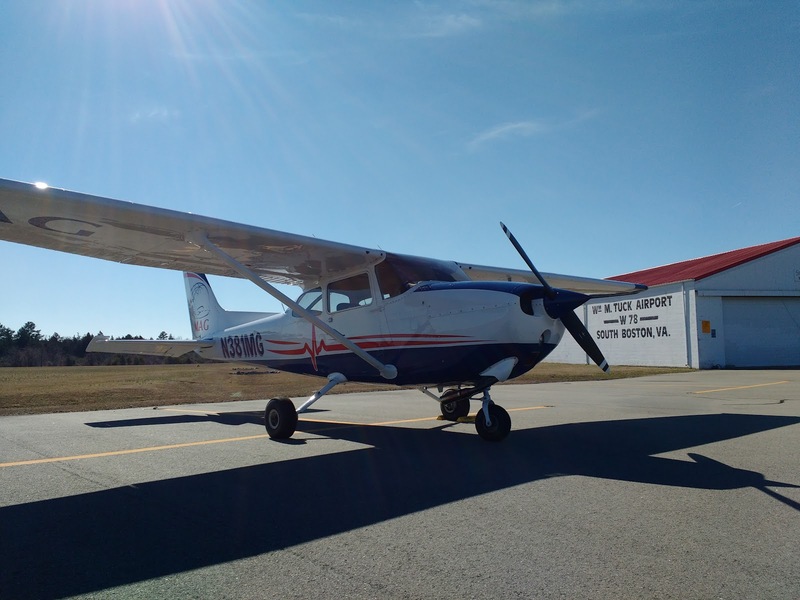 A generous friend of Compass, who had no previous connection to MAG, personally purchased the airplane and then made it available to us until ours could be repaired. What a blessing! This enabled me to continue my training and make progress toward my instrument and commercial pilot ratings. In the meantime, N381MG eventually made its way to MMS Aviation in Coshocton, Ohio for repairs. The team at MMS worked hard to get the project turned around quickly, with the goal of returning it to us by Christmas. Not only did they meet that goal, but they completed the repairs and annual inspection more than two weeks early! I'm extremely thankful for all of my friends at MMS who worked hard to get the airplane back to us so we could return N64328 to its owner, and so I (and the other apprentices coming to MAG soon) can continue to be trained for missionary aviation service. Yesterday, we returned N64328 to Shelby (well, almost to Shelby—but that's a story for another day). I'm thrilled to have our airplane back, with its updated instrument panel, newer paint, cargo tie-downs, and updated interior, but N64328 holds a special place in my heart as well. I flew many hours (112.6 to be exact, including 178 landings and 22 instrument approaches) and learned most of my basic instrument flying skills in that airplane. But, more importantly, when I see it I am reminded of God's kindness to me, and the fact that I'm surrounded and supported by so many wonderful people. When I'm worried about how my circumstances are going to turn out—or the future looks uncertain—I need tangible reminders like this. May I never forget that He is faithful. May I always be mindful of, and thankful for, the many people He has placed around me to support and encourage me! As we approach the end of 2017 and the beginning of 2018, we have a lot to be excited about! In April we will welcome a new child into our family. I have the opportunity to travel to Honduras in February to support a medical outreach to the remote Mosquitia region. We hope to take a vision trip to Bolivia, and—Lord willing—we will know which organization and field program we will be serving with by the end of the year. In 2018, I plan to finish my flight training and be qualified to begin serving as a missionary field pilot. Next year I will have the opportunity to do my first bit of flying on the field! The unfortunate reality is that all of these opportunities come with a price tag. If you go back through our blog, you won't find many posts that draw attention to our need for financial support. In fact I even wrote a post in March, in which I shared that I felt compelled not to send out appeal letters at that time. But as we approach the end of the year, facing many extra expenses and dwindling savings, the time has come to present our needs and ask that you consider partnering with us. Our most pressing expense is for a larger vehicle to replace one of our cars, hopefully before the baby arrives in April. After that, we will have the expense of travel to Bolivia and/or Honduras. In addition to those one-time expenses, we have been experiencing a shortfall of several hundred dollars every month due to an increase in living expenses and the loss of several ministry partners over the past few years. We are thankful that God has provided for us in the past, and we know He will continue to do so. But His provision always comes through people who are willing to sacrifice some material comforts to invest in the ministry that God has placed before us. We don't take that for granted, and we understand our responsibility to steward the resources He's entrusted to us. But, then again, aren't all of us—at least those of us who follow Christ—called to be faithful stewards of the resources that God has entrusted to us? 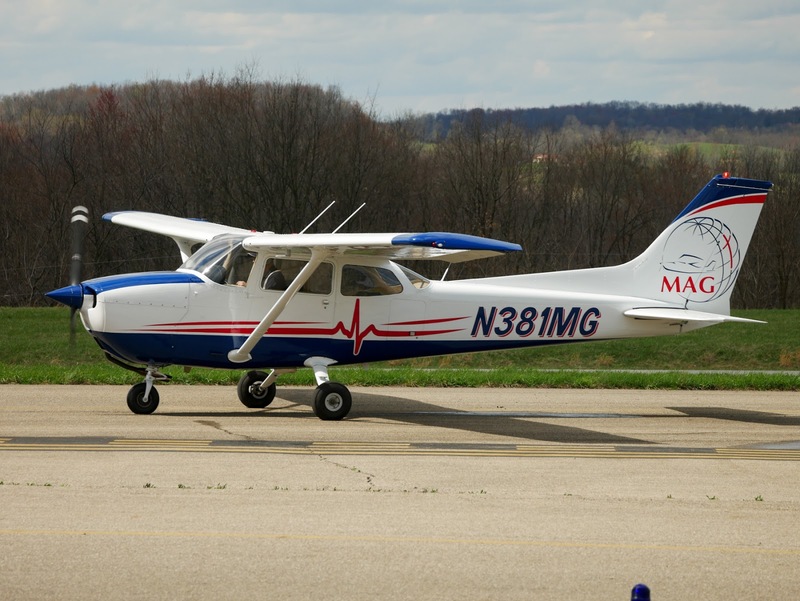 As we approach the end of the year, would you prayerfully consider investing in our family's ministry with MMS Aviation and Missionary Air Group? We are nearing the culmination of five years of preparation and training, and it's now—as we are on the cusp of transitioning into the role we've been preparing for all this time—that we are facing our greatest needs. If we're to keep moving forward, the Lord will have to meet our needs in some incredible ways; we surely don't have the means to do it on our own! For more information on how to invest in our ministry, visit our giving page! We recently finished our October newsletter, and though we had lots to share, one bit of news stood out above the rest: we're expecting another child to be added to our family next April! This was an unexpected twist in our journey, but we thank the Lord for this blessing to our family. If we're honest, the news of Tara's pregnancy brought about mixed emotions. Tara realized she was pregnant just as we were approaching the one-year anniversary of losing our son Ezra to a miscarriage at 17 weeks. In some ways, the joy of new life was overshadowed by the sadness of having lost Ezra, as well as the reality of how our plans for the next several months have suddenly changed. But as I sit here writing this post (having just posted our newsletter—and the news of the baby—on Facebook), many congratulations are coming our way. We also shared the news publicly in church this morning, to the excitement of our friends there. I'm thankful for the reminder that this new life is truly reason to celebrate. A lot of things will change for us, but every life is a gift from God, and we thank the Lord for this new addition to our family! That's the big news, but if you want to know what else has been going on, please check out our latest newsletter! Earlier this month, I was blessed to be selected as a recipient of the Betty Greene Missionary Aviation Scholarship. The purpose of the scholarship is: to encourage aspiring missionary aviators (pilot/mechanics or maintenance specialists) in their journey; to provide a financial blessing; and to make others more aware of the various missionary aviation organizations, Betty Greene, and the role of missionary aviation. Betty Greene was an accomplished pilot, and Missionary Aviation Fellowship's first pilot. You can read more about Betty Greene here. I was surprised, humbled, and encouraged to be a recipient of this scholarship. A number of representatives from several mission organizations came to the MAG headquarters in Burlington, North Carolina to present a check and some small gifts, and to encourage and pray for our family. This was a huge blessing and encouragement to us! The photo below shows the group that gathered for the presentation. The organizations represented included JAARS, Missionary Air Group, MMS Aviation, Mission Aviation Fellowship, and New Tribes. Our journey into the world of missionary aviation has taken various twists and turns, and we can't know for sure where the path will take us. But one thing is certain: the Lord has been faithful through the entire process, and He continues to bring people into our path to bless and encourage us. He's also provided all the resources we need to keep moving forward. We're thankful first to Him, but also to everyone who has supported us as we serve through missionary aviation! We recently sent out our latest quarterly newsletter! If you are not on our mailing list, you can view the newsletter by clicking here. Repairs are underway on MAG's Cessna 172 training aircraft. Please pray for the timely and cost-effective completion of the repairs. The kids finished school in May, then Ian and Ella played baseball and softball for a few weeks. We will be taking a family vacation and ministry trip before they return to school in August. Aaron has been working toward his instrument rating. The book work is mostly complete (he passed his knowledge test last week), and now he is focusing on the flight experience necessary for the instrument rating. We plan to do some Spanish language study over the next few months—at least enough to help us get around when we visit Spanish-speaking countries over the next year. Please pray that we will figure out the best way to fit this into our schedules, and that our study will be effective. You may also sign up to receive future newsletters. One Step Closer to Being Instrument Rated! Yesterday afternoon, after several months of study, I passed the FAA instrument rating knowledge test! Now that this is out of the way, I can focus mainly on accruing the flight experience required to take my check ride and oral test. For those unfamiliar with what an instrument rating is: it allows a pilot to fly solely by reference to the flight instruments when the weather is not suitable for flying under visual flight rules (VFR). With an instrument rating, a pilot can legally fly through clouds and in conditions where low visibility could cause a VFR-only pilot to become lost and disoriented, as well as conduct certain other operations where an instrument rating is required. There are several important aspects to becoming a safe and proficient (not just legal) instrument pilot. An instrument-rated pilot must manage a higher workload than a VFR pilot: maintaining aircraft control and situational awareness while following complex procedures, tuning radios and avionics, communicating with air traffic control, navigating, and managing distractions. But perhaps the most basic skill is learning to interpret and trust the flight instruments. Because an airplane maneuvers in a three-dimensional environment (unlike a car, which is stuck in two dimensions), the forces induced can play all kinds of tricks on our bodies when we can't see the ground or other visual references. For example, a steady coordinated turn is indistinguishable from level flight, as far as our vestibular system is concerned. The only way to know the true attitude of the airplane is to ignore what your body is telling you and completely trust the flight instruments. This takes practice and does not come naturally! Of course there are some spiritual parallels here. As we navigate life, there are countless voices influencing us, from within and from without. If we start listening to every voice that comes our way, we can easily become disoriented—much like the pilot who finds himself in a "graveyard spiral" through the clouds, sensing that something is wrong, but unable to escape because he can't interpret the instruments in front of him. In that situation, the only hope is to draw on his training, ignore everything he is feeling, and focus on the six instruments in front of him. He must then take decisive action, trusting completely that these instruments are telling the truth despite every sensation telling him otherwise. We live in a culture of subjective, feelings-driven truth. The problem is that feelings are unpredictable and can change at any time. And what happens when my subjective opinions and beliefs conflict with those of another person? Many words have been penned on these topics, and I don't intend to elaborate here. But as I train for my instrument rating, I can't help but think about the parallels to life, particularly as a disciple of Christ. I need to ask myself: am I training myself to know the voice of Jesus by reading and meditating on His words revealed through Scripture? Do I consistently meet with Him in prayer? My only hope if I find myself becoming disoriented and distracted is to focus on the Author of Truth. This is only possible if I have trained myself to hear and listen to His voice, lay aside the countless distractions, and trust completely in Him. Several weeks ago, this Facebook ad caught my attention. What really impacted me was the last line of the video: "I can't think of anything that'll make me happier". If you can spare a minute, take a look at the video below. As a father, I cherish the special moments and the shared interests that I have with my children, and on some level I can appreciate the sentiment expressed by this advertisement. I hope that my children will continue to take on some of the hobbies and interests that I enjoy, so that we can share them together. Some of my favorite memories involve spending time outdoors and playing music with my children. But to say that nothing could make me happier? If, when all is said and done, the best thing I've done for my children is to impart a love of music or camping or airplanes, then I will have done them a great disservice. Those things will pass away, but there are others that will last for eternity. But even as I am tempted to watch this video with contempt, having spiritual things in mind, I have to face the reality of my own life. Am I doing all that I can to instill in my family a love for God and a selfless, sacrificial love for others? Am I even living my own life in a way that is consistent with my stated priorities? Am I doing any better than the guy who lives his life for trains, sports, music, or anything else that will pass away? I'm thankful that God has given us many things to enjoy here on this planet. And I don't believe that we should live under the weight of guilt for all the things that we could or should have done; God has extended grace to us and we ought to live in that. On the other hand, He has prepared good works for us to do as an outflow of that grace-filled life. We are stewards of this life and everything with which He has entrusted us, including our families. Yet I am so easily distracted by the things of the world! Lord, help me—and those readers who desire to follow you—to live our lives not for what will perish, but for those things that are eternal. Let us leave a legacy to our children that is so much greater than trains or airplanes or sports: a legacy that will bear fruit for generations to come, and even into eternity. This eternal legacy is not something I can create and accomplish on my own; rather it's wrapped up in what Christ has done. There are many passages from Scripture that come to mind when I think about living with eternity it mind. Interestingly many of them are also in the context of the hope we have through times of suffering, but that's a post for another day! I will end this post by simply sharing two passages. I encourage you to consider the legacy that you will leave with these things in mind! We recently sent out our latest quarterly newsletter. If you are not on our mailing list, you can view the newsletter by clicking here. This was written two thousand years ago by the apostle Paul, in the context of thanking the Philippian church for meeting his physical needs while he traveled as a minister of the Gospel. Paul was reassuring the Philippians that God would, in turn, supply every need of theirs. This is a beautiful example of the way in which God uses believers to meet the needs of one another, and points us to the ultimate Giver of all good things. When the Body of Christ functions in this way, it is a blessing to the giver and the receiver, and a testimony to the Lord that we serve. If you have been following us and our ministry, you know that our income comes from the generous gifts of many individuals and churches, enabling us to serve full-time in missionary aviation. As I opened our statement from MMS Aviation this month, I was reminded of the faithfulness of God, and overwhelmed with gratitude for everyone who has partners with us in our ministry. 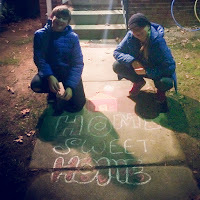 The dollar amount was not staggering, but we received some unexpected gifts that were just what we needed at this time. We knew our expenses would go up when we moved to North Carolina, and the increase was more than we expected. In response, I spent some time drafting an appeal letter that I planned to send to potential new ministry partners, to ask them to consider an ongoing financial commitment. I had the letters printed, and started prayerfully considering a list of names. But as I looked over that list, I couldn't come up with a single person to whom I felt comfortable sending an appeal. Then it occurred to me: did I even pray about whether I should send letters in the first place? I'm embarrassed to say that the answer is, "No." This is not a post about support-raising methods, and we have certainly sent our share of appeal letters in the past. We will probably send them again some day. But it is so easy to begin trusting in methods and strategies, even in Christian ministry. I sometimes look at the numbers, and when they don't add up I start strategizing about how we will make ends meet. But time and time again, the Lord has proven Himself faithful. And while it's a good feeling to get response cards with the "monthly financial gift" box checked, it is even better to know that we are being provided for by a God who knows every need even before we ask. As a concrete example, this month Tara participated in a mission trip to Mexico with a group from our church, which cost a few hundred dollars. We applied for the kids' passports so we would be ready to take them with us internationally: another $240. We incurred a number of other expenses as well, which we were able to cover from our savings, but eventually savings begin to run dry. But wouldn't you know it? I opened my statement Friday afternoon and noticed two sizeable, unexpected, donations. One of them was from a church we visited a while back, where I gave a presentation plagued with technical difficulties and distractions. I felt like I did a terrible job casting vision for our ministry, and I was sure I would never hear from that church again, despite having several personal connections there. But apparently I was wrong! Thank God for His provision, and that it does not depend on my eloquence! I don't intend to say that we can never make our needs known, and I believe there is a time for that. But before I start presenting my need to others, I need to ask myself where I am placing my trust. Is it in dollars and cents, and in my own strategies and plans? Or is my trust truly in the Giver of life and breath and every good thing? There is always the temptation to grasp for things that are tangible and that I can keep under my control. But it's my prayer that He may continually help me (and you) to keep our eyes fixed on Him, and to grow in our faith and trust in Him! It's Friday afternoon, and I thought I'd post a few photos from this past week. My work at the hangar has been a mix of flying (brushing up on maneuvers, navigation, etc), ground school (studying toward my instrument rating), and helping to organize the shop toolbox. The latter is not a glamorous job, but is one of those necessary mundane tasks that will reap benefits in the future. 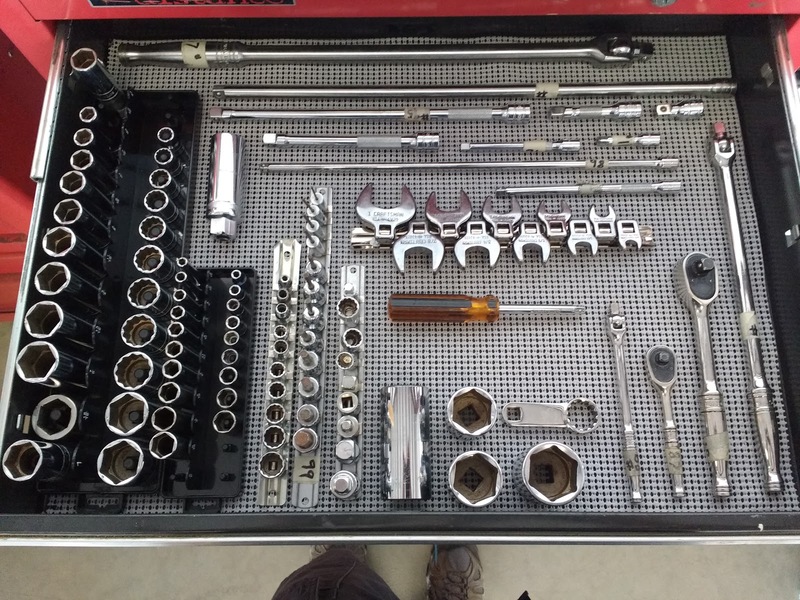 MAG purchased a rolling tool cabinet with lots of good tools, but they need to be sorted and organized so they can be used effectively by MAG mechanics and those who come to volunteer their time to help in the hangar. Now, as promised, here are some photos! It's been a beautiful week to fly! This photo was taken at Blue Ridge airport in Virginia, where I landed as part of a cross-country flight. On the same trip I landed in South Boston, Virginia where I got out to stretch my legs and chat with a gentleman at the FBO. My primary trainer (N381MG) sitting on the ramp in Burlington. I'll be spending many more hours in this airplane! This airplane at Blue Ridge reminded me of being a kid! My dad had an airplane like it in his office. It's a music box that's wound by turning the propeller. This could have been a nice photo if I would have thought to turn the coaster to face me! 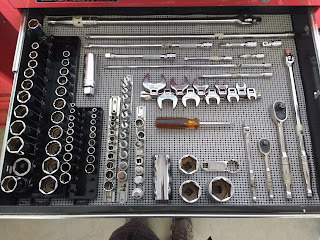 Organizing tools is not the most exciting thing, but when I'm finished it will enable maintenance to take place in MAG's hangar more effectively. 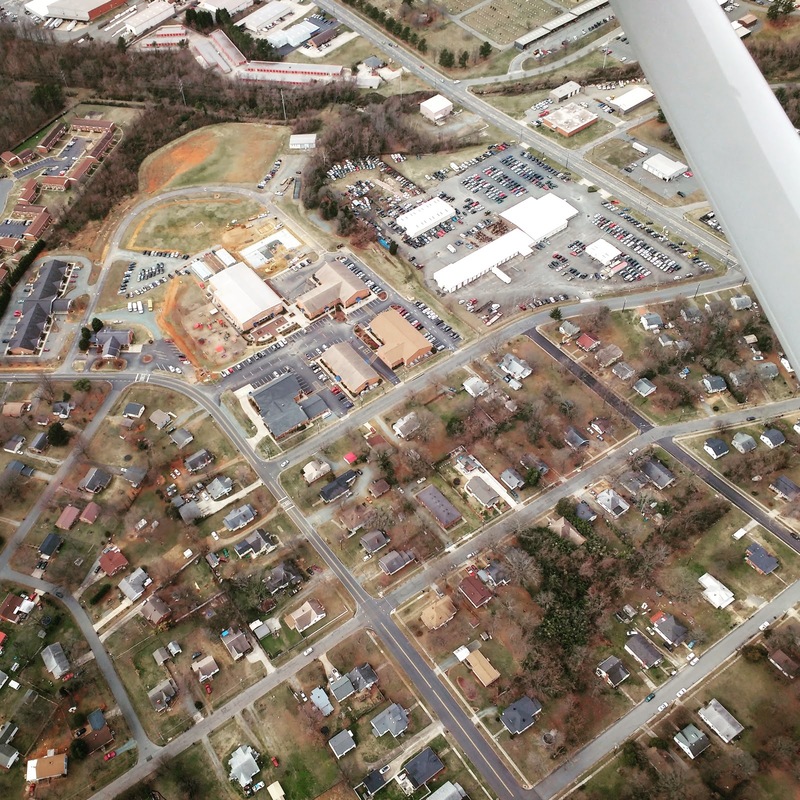 In the center of the photo is Burlington Christian Academy, where the kids attend school. I flew over during Ella's break, at her request, on my way to the practice area. Well, that's a sample of my week! 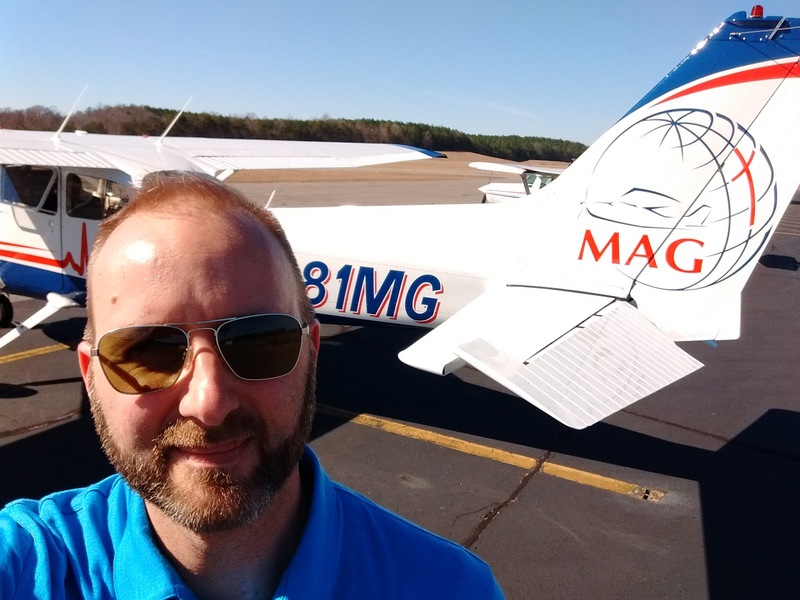 I'm excited to be making progress toward my advanced flight ratings, and toward overseas mission service, as well as supporting MAG's mission through the maintenance work I perform. There is a medical brigade currently taking place in Honduras, and I hope to share more information about it in the next few weeks. Even though I'm not personally on the field yet, I'm glad that I can help support MAG's field programs through my service at MAG. This week, I celebrated two significant events, each one involving a pen put to paper. 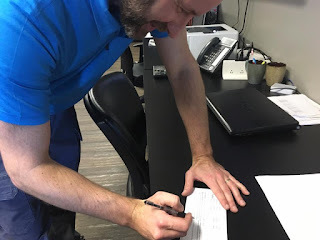 Earlier this week I exercised the privileges of my airframe and powerplant mechanic certificate and signed my name in an aircraft maintenance logbook for the first time. What's more, after putting the airplane back together I was the first person to fly it with the new modification. There's a sense of satisfaction in being able to maintain an airplane and then go out and fly it. My first maintenance job as an A&P mechanic. Signing off on my first logbook entry. The second significant signature was the one authorizing me to begin making solo flights in Missionary Air Group's Cessna 172. I already have my private pilot certificate and can legally fly alone, but before piloting MAG's airplanes solo I had to go through a checkout process. Since I haven't flown much over the last 18 months, I also needed a few flight hours to brush up on some of my skills and get accustomed to a slightly different airplane. Today, I took N381MG out for my first solo flight in that airplane. N381MG in front of the Missionary Air Group hangar. 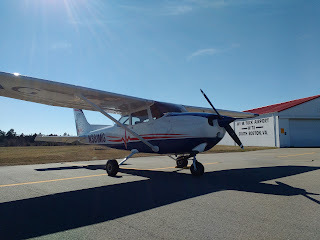 Today I made my first solo flight in this airplane. 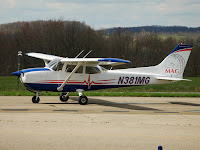 It's a privilege to be working with MMS Aviation at Missionary Air Group. I've got a lot of hard work ahead of me as I prepare for our international field assignment, but I'm thankful to be here and looking forward to the journey! Speaking of field assignments, we appreciate your prayers as we consider which organization and location to pursue. We have begun conversations with a few different missions, and are asking God for wisdom to discern the best place for our family to serve. Thank you, and we look forward to sharing more updates in the near future! Did you miss our January Newsletter? You can view the abbreviated version or the full PDF document right now! 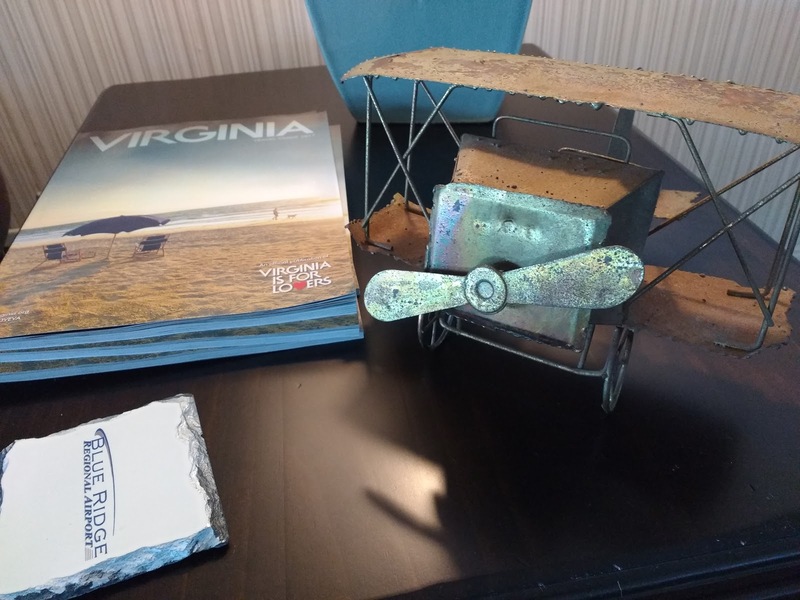 We've been in Burlington, North Carolina for a month already! We are mostly unpacked and settled in the house we are renting, and the kids have begun attending Burlington Christian Academy. 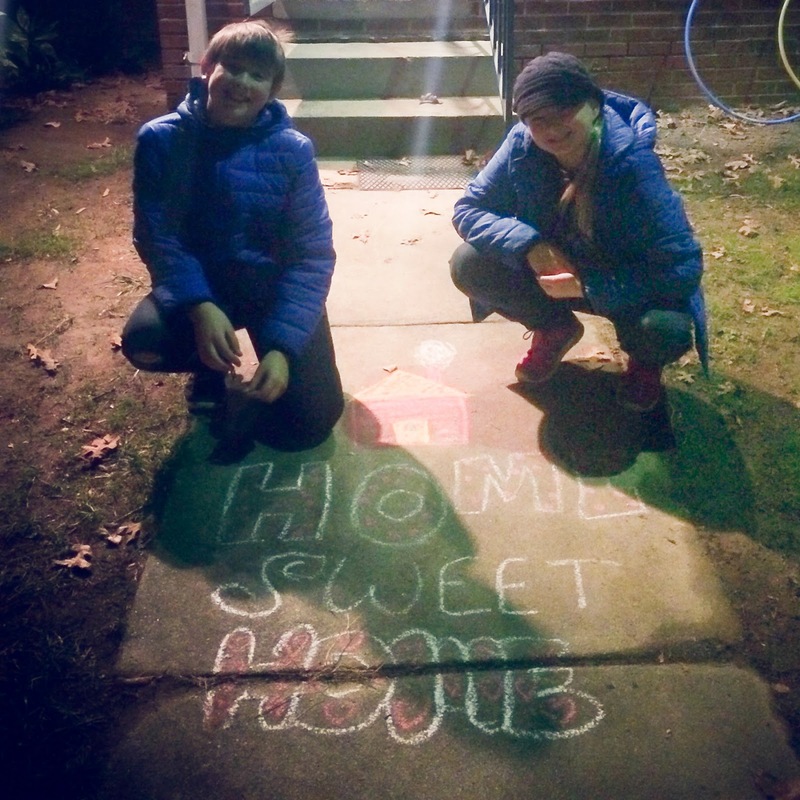 We've started making some connections in our neighborhood, and have already found a church that we are really enjoying. Our cars even have North Carolina plates, and we are licensed North Carolina drivers. I think we can say that Burlington is starting to feel like home! Next Monday, January 9, I will begin going daily to the hangar at Missionary Air Group. The first few days will be spent in orientation, then we will move into ground school and flight training. My weeks will consist of both maintenance and flight days. The flight days will focus on training and experience-building to prepare me for overseas service as a missionary pilot/mechanic. 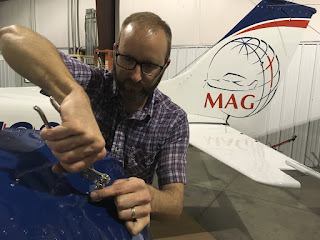 The maintenance days will help me keep my skills sharp, and give me the opportunity to contribute to MAG's mission by keeping their airplanes flying safely. Eventually, I will travel to Guatemala and Honduras to experience MAG's field programs first-hand. If you've been following our journey, you know that we are moving toward serving overseas in a missionary aviation field program. My experience at MMS Aviation the past three years has allowed me to participate in "frontline" missions by maintaining aircraft for more than a dozen organizations, but we are looking forward to the day when we will personally be serving in an overseas field program. Today, we had conversations with two different organizations—one in South America and one in Africa—about the possibility of joining their ministries when we complete our 18–24 months at Missionary Air Group. It's exciting to start exploring these opportunities, after several years of waiting and praying for God's direction. We were very encouraged by the conversations we had today, and are praying about the possibility of a trip to South America to see one of the ministries first-hand. Would you pray with us that God would clearly guide us to a mission where we can use the gifts and passions He's given us, and where our family can thrive? We are also praying that God will use the next couple years to prepare us well to serve in the ministry to which He calls us, and that our family will continue to grow closer together and to the Lord. To all who have encouraged, supported and prayed for us over the years: Thank You! We couldn't walk this path without you, and we thank God often for the many ways in which He has blessed us through the people He's placed in our lives. We can't wait to share more with you as we continue to move forward!